Here is our guide to the best bedroom paint colors for walls & ceiling including a variety of design ideas and pictures. While most people do not realize it, the color we choose to paint our homes not only reflects us as people and our personalities, but also it effects our moods and thoughts. Colors won’t affect everyone the same way either. Culturally we view colors as meaning different things, therefore we will find different things safe or comforting. The color one selects for a bedroom can have a drastic impact on the mood. With this in mind its a good idea to carefully consider the wants and needs for the space, whether they be a relaxing sanctuary bedroom, a romantic spot, brightening the space, or even just preparing to sell the home in the future. When picking bedroom colors in particular, one will want to focus on the elements of temperature and brightness of the colors at hand. This will give the greatest effect towards the type and feel of bedroom the space will become. Temperature – Temperature is usually something one would think about when deciding the clothes to wear that day, and color temperature is strangely similar. Warm colors make a person feel happy, energetic, even optimistic, they can even increase appetite. These colors include oranges, yellows, and reds. These are typically not recommended for the bedroom setting due to its upbeat and stimulating effects. Colors that are recommended are cool colors, such as, blues, greens and purples. These invoke feelings of calmness, serenity, and peacefulness, something that is preferable in an area for sleeping and relaxation. Brightness – Brightness can have a very large effect on a space, just as it can in a life. We turn the brightness on our screens up and down, we change the brightness of a room by closing blinds or curtains. Well, we can also do this with paint colors. This can help set the mood of the space as well. After the temperature of the color has been selected, or at least the color family, take a look at the brightness. Remember that bright and light mean very different things. Light green could be a viable option, while bright green most definitely will not. A bedroom, in most settings can look best with a lower brightness, ruling out any neon and bright colors. Paler options will bring a lighter and airy feel overall. Colors all have a psychological value as well, the way colors make people feel, just by making contact with their eyes. It is important to remember when painting a bedroom that the room is pleasing to the primary user and matches their own sense of personality and style. When you do find a paint color you like you can download a paint color app to give you the name of the paint by uploading a picture. Here are some examples of colors and how they can impact one’s general mood and well being. Blue– Blue is a color that will calm people down, plus bring down heart rate and blood pressure. But blue can also make a room a little colder due to its cool tones. Blue in a room has been shown to lower the heart rate and may even reduce blood pressure. One important thing to note is painting your bedroom a light cerulean to cadet blue has been shown to help increase the resale value of your home when selling. Neutrals – including all browns, blacks, whites and anything in between Neutrals take up a bigger part of a color scheme than anything. When designs are getting out of hand with color, throwing in a neutral will bring any room back into its right space. Red – Red amps up the energy. Everything is on high alert and adds excitement as well as can stimulate conversation. Pink – The color pink is associated with love and nurturing. It can give a bedroom a calming vibe and is often related to femininity and love. Pink is a tint of red that is frequently used to paint girl’s bedrooms. According to realtor studies selling a home with a pink bedroom can actually lower resale values by a couple hundred dollars. Yellow– Yellow tends to translate to happiness as well as uplifting. Although, studies show that it may cause people to have quick tempers. Green – Green is used as a refreshing color. This color encourages restfulness as well as comfort and warmth. Purple – Purple is associated with luxury and creativity when using a darker shade. As a lighter color purple may offer some of the same restful qualities as blue. However, on the negative side, sleep studies have shown the color purple to actually suppress sleep. Since purple is known to actually stimulate the brain it can make it difficult to sleep. Orange – Orange is an energetic color, filled with excitement and is often used in creative or high energy places such as a kids play room, crafts room or home gym. When thinking about the color to paint the walls it is always important to remember the finish of the paint as well. The three choices of sheen on a paint are flat, eggshell, and satin. Flat – To soften a space one would use flat. Flat sheen is a matte finished that is non-reflective. This makes it difficult to clean but perfect for an adult bedroom that does not receive much wear and tear, made to be soft and light. Eggshell – Eggshell is the in-between sheen, mildly reflective, easier to clean. This is the most effective paint sheen to use in regularly used bedrooms. Satin – Satin, also commonly referred to as glossy finish, is as the name suggests, the glossiest. This makes it durable and cleanable, suitable for high traffic areas and mess prone areas such as children and teenager bedrooms. Everyone needs sleep, everyone wants a better sleep. Some will try strange home remedies to get better sleep, from acupuncture to drinking cherry juice. Little do they know the simplest remedy lies right in front of them, the colors of their bedroom. Color theory is guidance to color mixing and the study of the visual effects of certain color combinations. This study is how we know that certain colors effect people in certain ways, and why. For example, blue is the absolute best color for sleeping. This is because receptors in the eyes that effects one’s circadian rhythm are sensitive to the color blue, therefore seeing this color reduces heart rate and blood pressure. Granted this is not the only thing that can decide if a person sleeps well or not, just an added bonus when painting bedrooms blue. These add to the space to create the best calming and relaxing bedrooms, physically and mentally. Besides blue some other best bedroom paint colors for a good night’s sleep surprisingly include yellow, green, silver and orange. Some of the worst colors for sleep include purple, brown, gray, gold and red. This is a according to a Travelodge UK study that analyzed 2000 bedrooms to determine which ones where best and worst for good sleep. 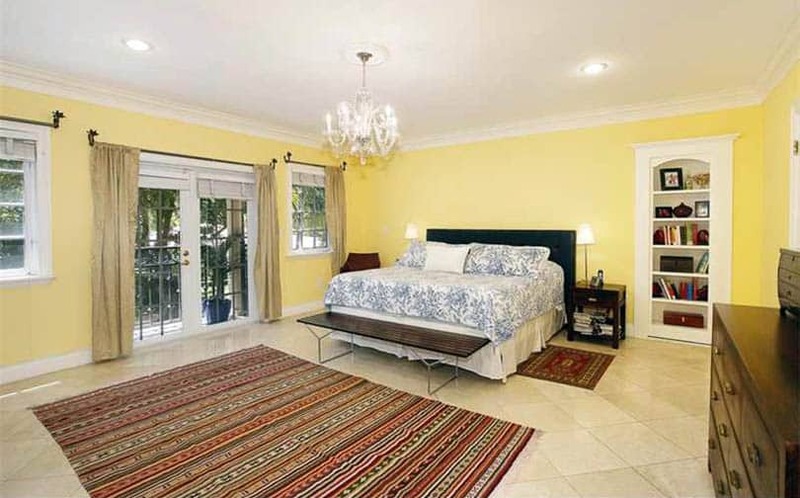 Everything about the home is perfect, except the tiny master bedroom. Bought anyways because of the to-die for kitchen and bathrooms, but now to deal with feeling cramped every single night. Fear not, there are ways to counteract the feeling of a small bedroom without tearing down any walls or giving up any more space. Light colored walls are a small bedroom’s favorite outfit. While people usually wear black to slim down, the same idea (just backwards) is used to make rooms look larger. Generally, using a higher sheen will make the room look larger due to it being more reflective. Other things one can do to increase the look of the size of the bedroom is painting the trim a lighter color than the walls. This is just a little optical illusion that will make the walls appear that they are farther back, when in fact, they are not. Master bedrooms most frequently house couples, and while one half may want to completely take over with their style, it is important to remember that there are two that will be spending time in the space. Things to consider are: how the space will be used, what mood is trying to be set, and what colors can be agreed upon. Some bedrooms are used purely for sleeping. In this case, the couple may want to stick with a cooler more relaxing color. Some bedrooms have sitting areas, spaces to get ready for the day, or even spaces to hang out with others. If any of these are the cases, turning the brightness levels up a bit can create a more energetic environment. Any colors can be used in the bedroom paint as well, if red is both parties favorite color, it can be incorporated. This can be done in either muted tones or even adding pops of the color to furniture pieces, trim, or accessories. Both gender neutral muted colors to remain not harmful to sleep while still put a little pep in the step in the daily routines. If a calm, cozy hangout is not the right fit, maybe a romantic, dramatic bedroom better fits a couple’s style! This can add massive amounts of unique qualities and even more paint color options. Once straying away from the soothing blues, we can be whisked away by the romantics of purples and magenta’s. Often romance is associated with these colors, as well as red and colors of fine wines. Pinks and purples tend to stray towards the flirty and fun side of romance, which can work perfectly for some spaces. For a deep, rich, intimate bedroom, sticking with darker colors will be the way to go. Even black can be a great option if looking for an intimate yet simplistic bedroom. Both darker more intimate colors to set the mood for romance, humbled as to not overpower the room. The color you select to paint your ceiling will depend on several factors including the style you want, the size of the bedroom and its shape. 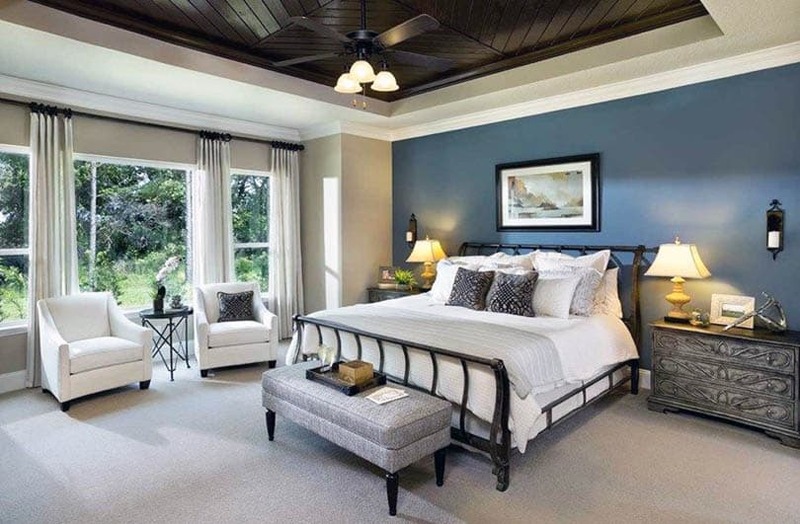 Painting your ceiling and walls the same color works best for bedrooms with flat ceilings. If you have a small bedroom using dark colors will make the space feel smaller and more intimate. While on the other hand painting the room a lighter color will give it a roomier feel. For larger rooms using the same color for both the walls and the ceiling will give it a cohesive look and draw the eye to the furniture and decor. Painting your ceiling a lighter color than the walls can give the walls the appearance of being larger. In addition it provides the room with a low contrast look making it appear flatter. If you have white walls you can try painting your ceiling in a pale yellow, light peach, light blue or light gray to create a cozy ambience. Painting the ceiling in a darker color can be used to bring focus to your molding or trim as well as add high contrast and make the room feel more intimate. For a dramatic high contrast look, when the walls are white, paint the ceiling in gray, brown hues or in navy shades. There are also reasons you may want to paint your ceiling white. For instance if your bedroom doesn’t get a lot of natural light, going with white is a good choice to keep things bright. If your ceiling has a lot of visual blemishes, going with a flat white can help mask them while using a color could actually make these imperfections stand out. The main focus of your bedroom should primarily determine the paint color for the walls. To get the right color carefully consider the mood that you want to set. When looking to make a small bedroom look bigger you may use Sherwin William, Topsail. Having trouble sleeping at night? Try Sherwin Williams, Snowdrop. Looking for a color both halves of the couple will enjoy? Try Sherwin Williams, 6814 breathtaking or 1668 pineapple cream will halt all discussion. Like to get romantic and need the perfect space, check out Sherwin Williams 6307 Fine wine, or even 6321 Red Bay to set the mood. We hope you found some useful ideas for choosing a paint color for your bedroom, for even more ideas check out our post on using a bedroom layout planner to quickly try out different colors, furniture and decor on your own design.